Statistics: How Many Would You Check? Russian Translation, thanks to Vlad. Ukrainian Translation, thanks to Sandi. Estonian Translation, thanks to Johanne. Spanish Translation, thanks to Laura. French Translation, thanks to Jean-Etienne. How many users would you have to check to feel confident that everything worked for at least 95% of users? if you don’t check, you don’t know: confidence is 0%. After all, maybe your batch update didn’t work at all, but there were no error messages. if you check some users, maybe 10, and the update worked … you can start to feel good. How confident can you be? I don’t think the answer is obvious. I had to take some time to think about it. I remembered reading How Not To Sort By Average Rating, and I thought I could apply the same logic to this problem. If you only have one review, and it’s positive, is that 100%? Intuitively, we know that it’s not: it’s just one person’s opinion. As more and more people give positive reviews, we can start feeling better about the accuracy of the score. Given the ratings I have, there is a 95% chance that the “real” fraction of positive ratings is at least what? We can use the lower bound of the Wilson confidence interval. In other words, if we sampled 18 positives and 2 negatives (18/20), the “real” fraction probably falls between 0.699 and 0.972 (mean: 0.9). The upper bound isn’t interesting: we’re not interested in the best case scenario. But if you check 10 and they are all successful, you can feel confident that it worked for (lower bound) 72.2% of users. 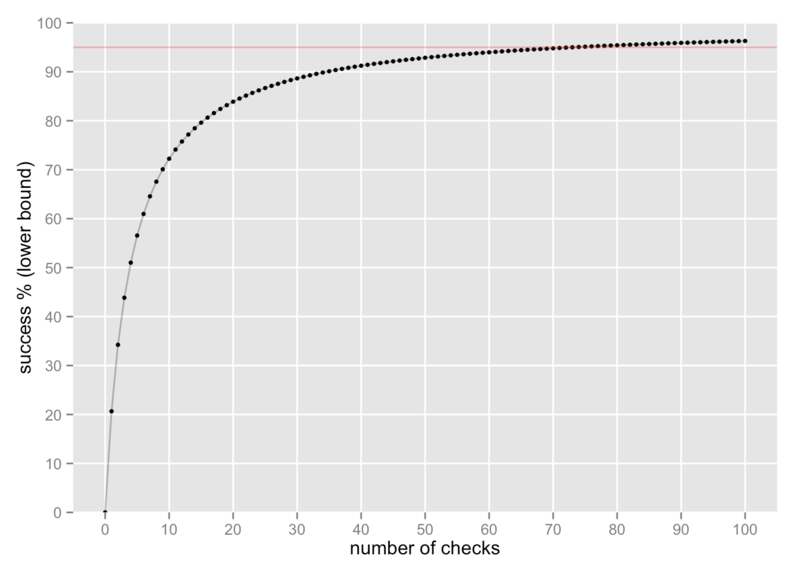 It takes 73 checks to reach a lower bound of 95% of “true” success (the red line). Here is the analysis as a RMarkdown document and the resulting output html document.